In traditional hand tool woodworking, the hand saws are the main workhorses of the workshop. We use them for breaking down rough stock into smaller, more manageable sizes. We use them for cutting project parts to final dimensions. We use them for sawing out the joinery that holds the project together. There are very few steps in the process of building something out of wood that don’t require the use of a saw. One could argue that you really don’t need any more than one or two saws in your tool kit. On the one hand, there is some merit to this statement. Let’s face it, the job of all hand saws is simply to cut the fibers of the wood. When this process is viewed at a high level, sure, you could use just about any hand saw to do the job. I could use a single regular old hand saw to crosscut boards, rip boards, and make joinery cuts. But is that really the most efficient way to do things? Our ancestors didn’t think so. The engraving pictured above is an example of the basic hand saws commonly manufactured in Sheffield, England in the early 19th century. 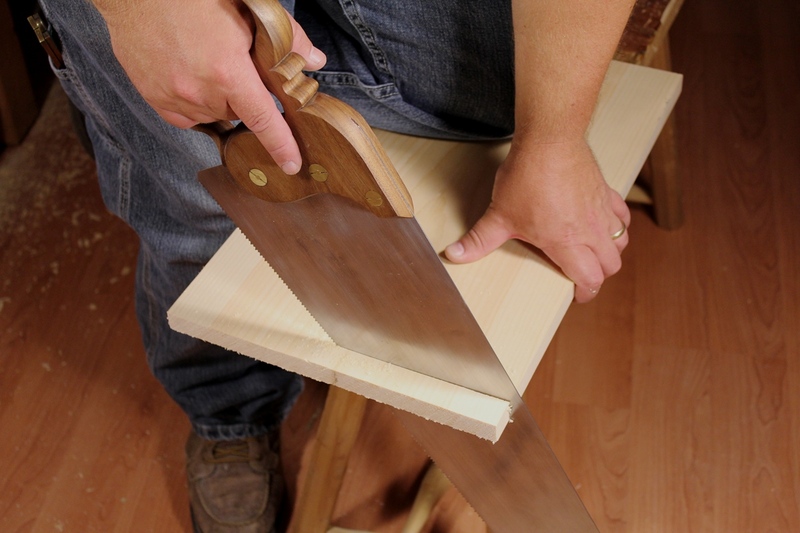 Most people will recognize these saws as the typical Western form, still commonly used today. 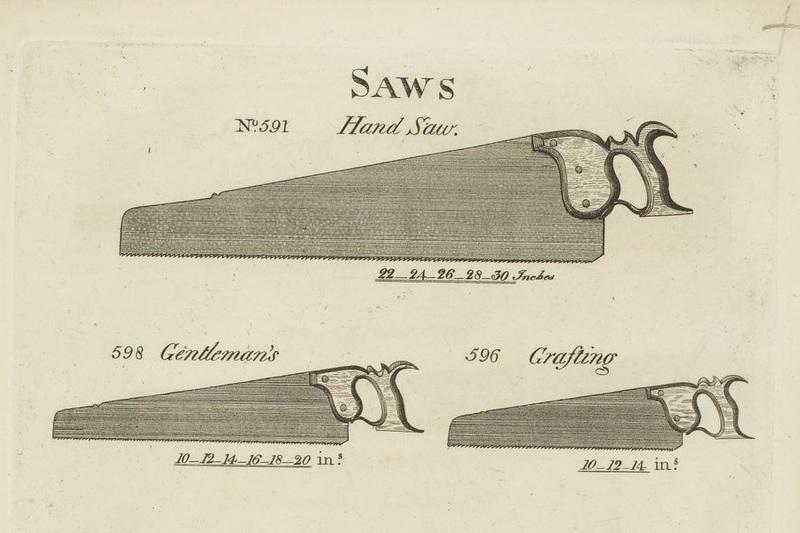 During the 19th century, frame/bow saws were more commonly used in continental Europe, but I’ll save the discussion of framed saws for another day. § 45. Of Saws in general. Pl. 13. Fig. 6, 7, 8, 9, 13. A saw is a thin plate of steel indented on the edge for cutting, by a reciprocal change in the direction of motion, pushing it from, and drawing it towards you. The cut which it makes, or the part taken away in a board, is a thin slice, contained between parallel planes, or a deep narrow groove of equal thickness. Saws are of several kinds, as the ripping saw, the half ripper, the hand saw, the panel saw, the tenon saw, the sash saw, the dove-tail saw, the compass saw, and the key-hole or turning saw. The teeth of these saws are all formed so as to contain an angle of sixty degrees, both external and internal angles, and incline more or less forward as the saw is made to cut transverse to, or in the direction of the fibres: they are also of different lengths and breadths, according to their use. The teeth of a saw are bent alternately to each side, that the plate may clear the wood. Nothing earth shattering here, just a general description of what a saw is. One thing does stick out though. Nicholson names 9 different saws, so one has to assume that there is some specialization going on here. He further goes on to describe the individual saws. The first four saws he describes are unbacked, long saws. Is used in dividing or slitting wood in the direction of the fibres; the teeth are very large, there being eight in three inches, and the front of the teeth stand perpendicular to the line which ranges with the points: the length of the plate is about twenty eight inches. Is also used in dividing wood in the direction of the fibres: the length of the plate of this is the same as the former, but there are only three teeth in the inch. § 48. The Hand Saw, Pl. 13. Fig. 6. Is both used for cutting the wood in a direction of the fibres and cross cutting: for this purpose the teeth are more reclined than the two former saws: there are fifteen teeth contained in four inches. The length of the plate is twenty six inches. Is used for cutting very thin wood, either in a direction of, or transverse to the fibres. The length of the plate is the same as that of the hand saw, but there are only about six teeth in the inch. The plates of the hand saw and panel saw are thinner than the ripping saw. The first thing that I noticed reading through the descriptions of these four saws the first time that I read Nicholson was that there was no dedicated crosscut saw. I think this is interesting to note. He describes two saws for cutting only in the direction of the grain (rip cuts) and two saws for cutting either in the direction of (ripping) or transverse to the grain (crosscutting). In Nicholson’s description of hand saws, there is no mention of hand saws with fleam dedicated to crosscutting. Did our ancestors crosscut boards using saws with rip teeth? The next thing I noticed was the number of teeth per inch in each of the saws. The first two have me somewhat confused. The Ripping Saw has 8 teeth in three inches (which equates to about 2½ teeth per inch or 3½ points per inch). These teeth are very large and would have likely been used for some pretty thick stock. The Half Ripper has three teeth per inch (or 4 points per inch). This is very close to the number of teeth per inch in the Ripping Saw, so I wonder what other differences there might be? The Ripping Saw describes teeth that “stand perpendicular to the line which ranges with the points” (i.e. zero degree rake). The Half Ripper makes no such distinction. Did the Half Ripper have more rake? What I get from these two descriptions is that these two large rip saws were likely set up for different uses. The first (The Ripping Saw) perhaps for thicker and/or softer stock, and the latter (The Half Ripper) perhaps for slightly thinner stock that was perhaps slightly harder. The next two saws are described as multipurpose saws, used for ripping and cross cutting. The Hand Saw is described as a 26″ saw with a plate that is thinner than the two large rip saws and fifteen teeth in four inches (about 4 teeth per inch or 5 points per inch). It also has more rake than the two large rip saws. The Panel Saw is a finer saw still, having 6 teeth per inch (or 7 points per inch), and is described as being used for cutting “very thin wood”. Again, what I get from these descriptions is that you have two more saws that are dedicated to certain tasks, i.e. crosscutting and ripping certain thicknesses and/or species of wood. Of course the Nicholson text is but one example from the 19th century, but I think it is a good representation. What does this mean for the modern day joiner and cabinetmaker? Well, for one thing, there may be some merit to having multiple saws of similar design/function, depending upon your needs and work habits. I’ll leave you to think about the long saws for now. Next time, I’ll talk a bit about the joinery saws. Posted in Hand Saws, Tools and tagged crosscut saw, rip saw.